I wasn't always a quilter. My design talents started when I was about 8 years old making my own Barbie clothes out of whatever I could get my hands on. I then taught myself how to crochet from a book at age 10 or 12. In middle school, I had my first sewing class and things took off from there. I not only constructed but designed my own clothes. I constructed ladies suits, men's suites, evening gowns and even my own wedding gown. I entered the working world and motherhood and began sewing home decor, bedroom suites, draperies, upholstery, slipcovers, you name it I did it in fabric. One day I saw a wall hanging that was pieced and quilted and I had to make it. The rest is history! As an ongoing effort to perfect my skills in this profession, I take as many classes as possible. 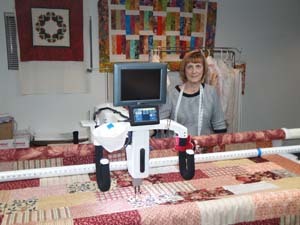 Most recently I have taken classes by some of today's most respected names in the longarm and quilting industry such as Dustin Farrell, Karen McTavish, Sharon Schaumber, Dawn Cavanaugh, Claudia Pfeil, Sue Patten, Cathy Franks, and Linda McCuean, to name a few. I also attend as many quilt shows as I possibly can to keep the creative ideas flowing, as well as being an active member in several Longarm and Quilting Guilds. I am constantly striving to learn new techniques and broaden my quilting horizons.